Greens are easy and pleasant to human eyes. 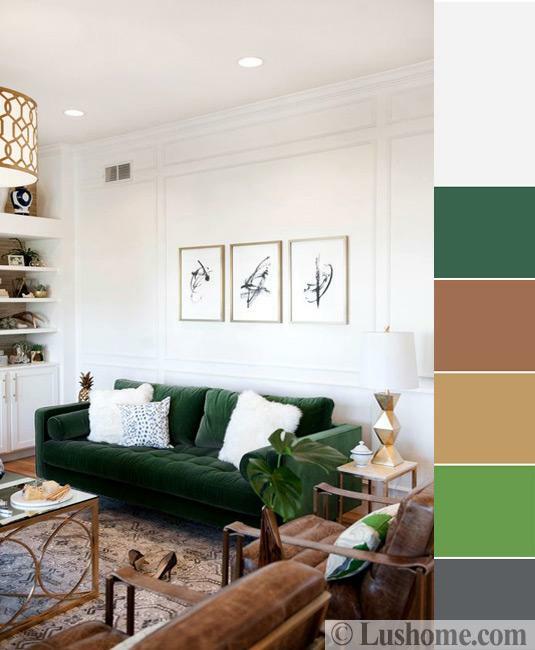 Natural green colors connect us with nature and create beautiful combinations with all natural hues. Green colors are the trend which is timelessly elegant and always modern. Designers like to experiment with green colors creating modern home furnishings and spectacular green walls. 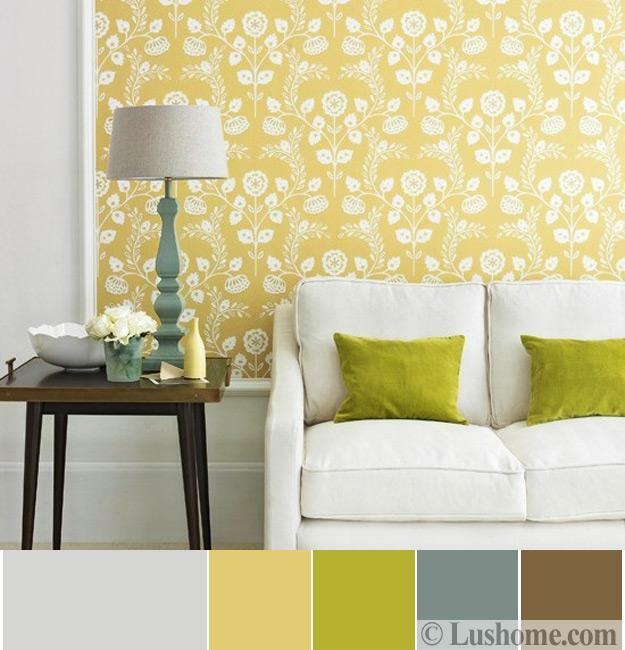 New shades of green, pastels and warm shades add a fresh look to textiles and floral patterns. 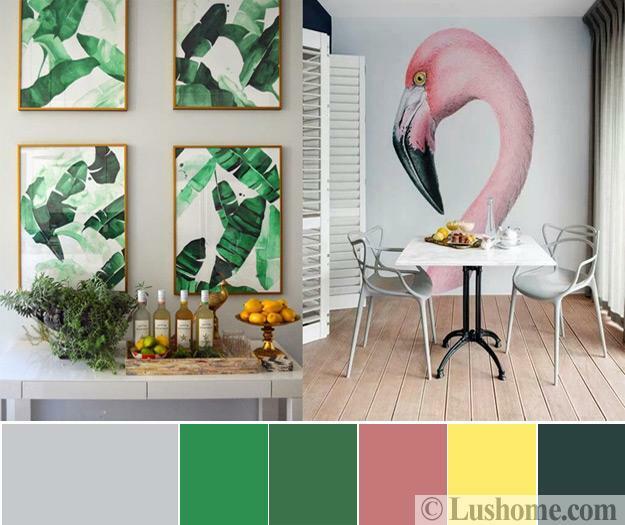 Lushome gives just a few reasons why people love green colors. 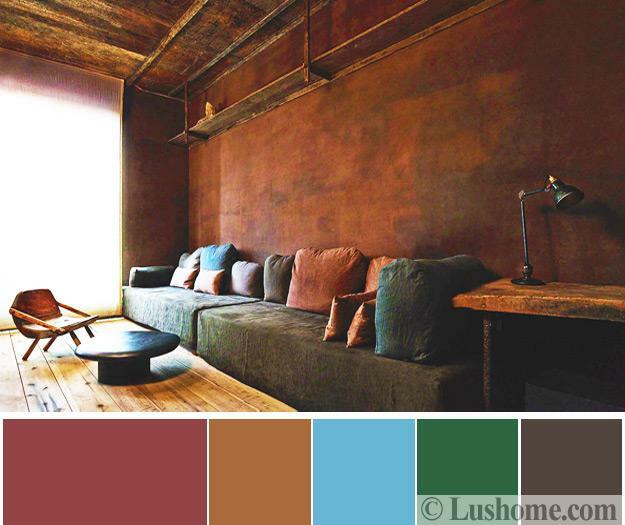 Here are tips for using green color shades and tones in modern interiors. 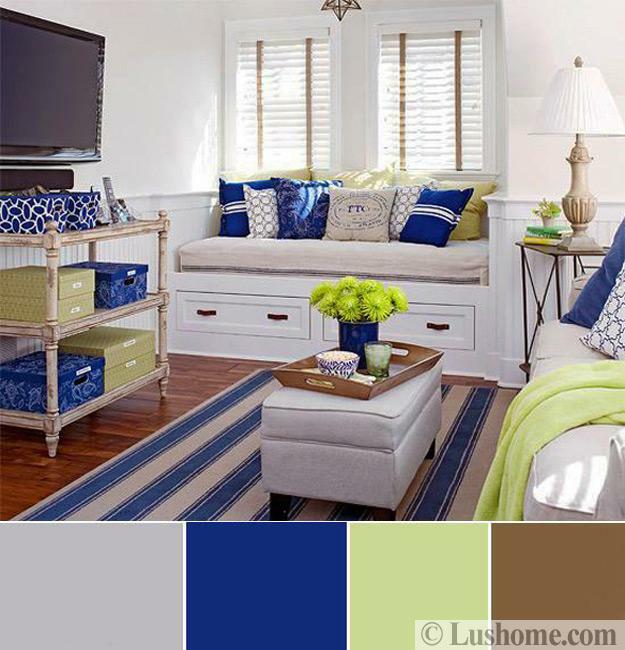 Modern green hues and color combinations are excellent for creating relaxing and comfortable interior design. Greens can be bold and playful, quiet and calming, exciting and energetic. 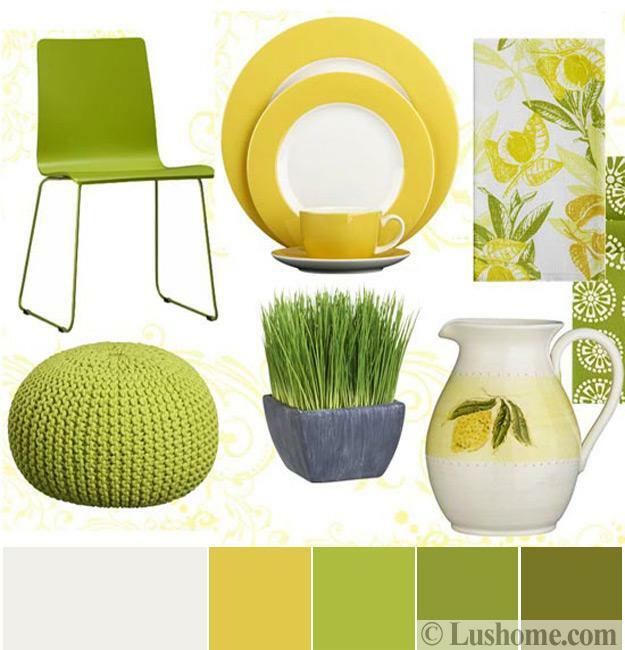 Green color hues blend with yellow to brighten up modern rooms and create welcoming and pleasant atmosphere. Cold greens are perfect for balancing yellow, orange, and red colors, and emphasize grand interior design in gorgeous blue. Green can be relaxing and energetic. Pale pastels are ideal for quiet bedroom designs and baby room decorating. 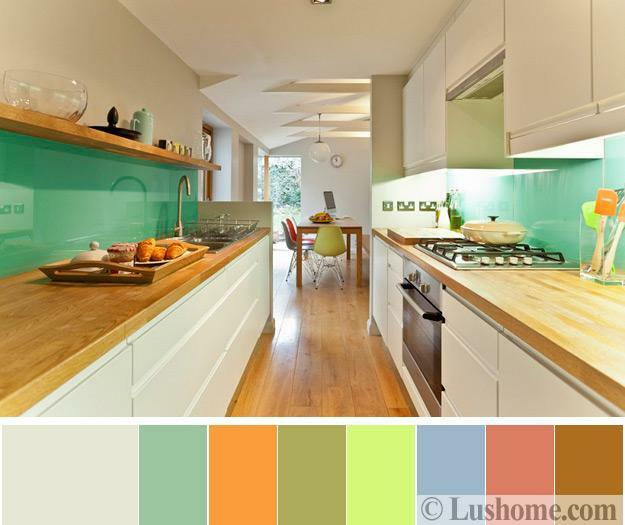 Bright greens are powerful and energetic, perfect for cheerful and fresh interior design. Kids rooms, home offices, and bathrooms with emerald green walls and decor look fabulous offering relaxation, concentration, and meditation. Dark green shades or light green accents are hard to ignore. Walls in vibrant green color, kids furniture in bright green, or decor accessories in light green shades are perfect for accentuating the modern interior design. Greens tell status, create interest. Green tile designs and ceramic vases, textiles and green paint are fabulous tools for bringing stylish contrasts into modern interiors. Light, fresh green hues set the right mood. Green accents look beautiful in all living spaces. Use them as accents in furniture, textiles, decor, or kitchen utensils. Fresh green or lemon green are perfect choices for accentuating kitchens, living rooms, bedrooms, kids rooms, and nursery decor. 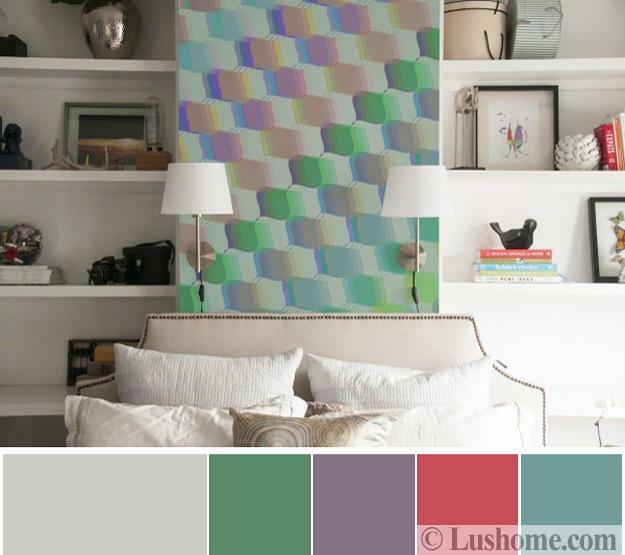 Pairing light greens with purple colors create stunning effects in modern rooms. Olive, mint, and sage are stylish and beautiful green hues which are always popular. 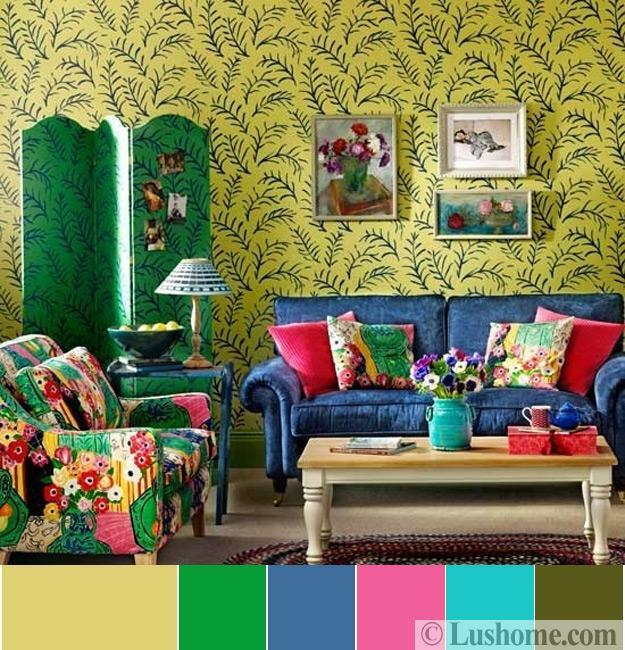 These green colors associate with sunny meadows and tropical countries. 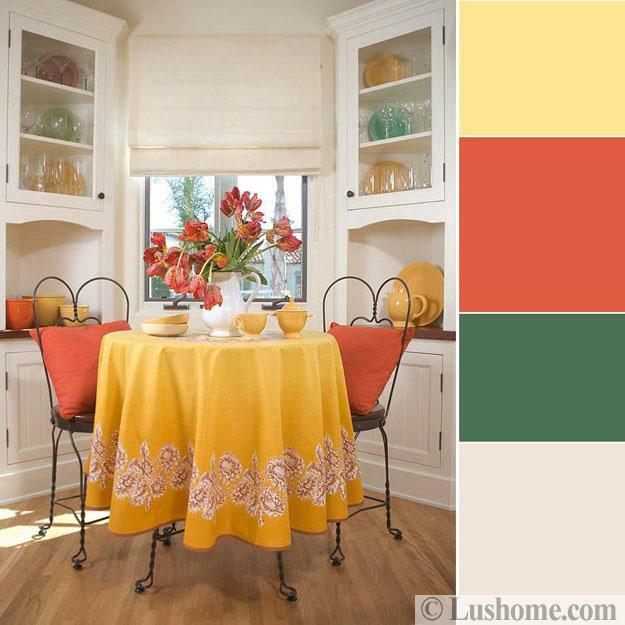 These hues are soft and pleasant, ideal for charming and almost neutral backgrounds. Suitable for walls, floor carpets, curtains and living room furniture, these modern green colors add a fresh and trendy look to city apartments and summer homes. Warm green shades are the best for decorating small rooms. Cool green tones make beautiful accent walls and small accents. Blending crisp greens with warm yellowish hues or beige balances bathroom design and harmonize the small spaces. Sage green pairs with warm wood shades and flax or oat neutral colors. This green color combination looks balanced and harmonious. Warm greens work well with vibrant blue, turquoise, dark orange, burgundy, red wine color shades and purple colors. Pistachio green, olive, and lemon green tones look fabulous for country home decorating. The minimalist style interior design calls for fresh and neutral pastels, grayish olive, and milky-green colors. Emerald green is bold and delicious, perfect for striking interior design in eclectic style or gorgeous Art Deco interiors. Green colors are fabulous for experimenting. Bright and saturated, light and diluted hues offer many color combinations for every interior design style and function. Versatile and universally appealing greens add unique character to all architectural features and home furnishing, bringing beautiful furniture, decor accessories, lighting fixtures into every room. Green accents are a perfect way to personalize any interior design.